MS Office Ultimate Deal Is Back! Going back to school? Looking for a Microsoft Office Deal? The limited time 91%-OFF deal for college students is back! 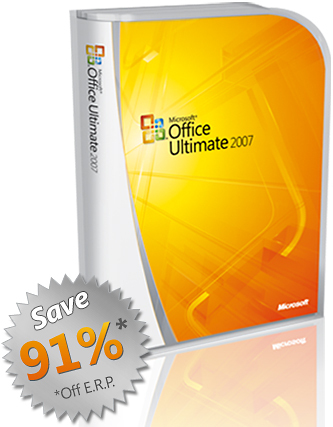 Microsoft is currently offering a special edition of their suite entitled “Office Ultimate 2007” which includes full editions of Access, Accounting Express, Excel, Groove, InfoPath, OneNote, Outlook, PowerPoint, Publisher, and Word for just $60. If you are currently a student, you’ll no longer have to find $300 for some of those apps. To be eligible for this deal, you must have university email address at a ‘.edu’ domain and must be enrolled in at least 0.5 units of course work. We highly recommend taking advantage of this deal since the next cheapest Microsoft Office bundle, the Student and Teacher Edition, costs over $80 and only includes four applications. And if $60 bucks is still too much, the next best alternative is Open Office which is an open source office suite available for download at no cost. In case you are wondering, Open Office is completely legal and is distributed by Sun Microsystems, however I still recommend Office Ultimate for $60. Its gonna take a little time downloading, esp if you’re on a campus that limits bandwidth. Be sure to save it on a DVD at some point too, or pay the additional 6 bucks to back up your download. It should work just fine with a UC Email, I had a couple of college friends who bought it before they started college as well. They had just bought new laptops and wanted it to be all setup before they started school. So good luck, hope this deal works for you!